I asked a provocative question at the Armenian National Committee (ANC) Grassroots conference, on November 25, 2011, regarding the catastrophic proportions of emigration from Armenia, calling it “the white genocide of 2011”. I made sure to emphasize the controversy of the wording, over which the members of the Diaspora community appear to be divided. I wanted to get more opinions. “White genocide”, as defined in Wikipedia, is the term Western Armenians use to describe assimilation in the West. Until the first years of Armenia’s independence, it has been referred exclusively to the aftermath of the Armenian Genocide of 1915-1923. However, the mass emigration that followed Armenia’s independence was often associated with ‘white genocide’ by the public at large. What Eastern Armenians are going to face in the future outside their homeland is most probably gradual assimilation. The reality is that today about half of the Armenian citizens prefer the prospect of non-violent assimilation over a life doomed to poverty, humiliation, and injustice in their homeland at the hands of their own government. Even at the metaphorical level, Tankian doesn’t appear to see any genocidal tendencies in the history of Armenian people beyond the Armenian Genocide of 1915-1923. Tankian then began giving excuses for the current situation in Armenia: “Armenia is not the only. You have to view things in a geopolitical perspective, not just from the eyes of an Armenian, obviously.” Then he indicated an achievement: “The greatest thing about Armenia is there is no fear of speaking the truth. You know, that’s one thing on our side, which doesn’t exist in some other post-Soviet republics.” Exactly, ‘some’ other republics, but not ‘all’ the others. So, why not compare Armenia with the other republics that have done much better since the fall of the USSR? To put it simply, their response means that whatever happens in Armenia is normal. All you have to do is look at it from the geopolitical perspective. When Serj Tankian or Eric Nazarian speak of Armenia’s geopolitical region, I wonder if they understand all sides of the geopolitical perspective themselves. Situated to the north of Armenia, Georgia was a lot worse off in 2003 than Armenia and any other former Soviet republic. However, this country was able to consolidate its potential and get rid of its corrupt regime. Since then, war-torn Georgia has made such essential democratic reforms that it has stepped into the European Union with one foot. Armenia has Turkey and Azerbaijan as enemies; Georgia has the gigantic Russia. Armenia won a war with Azerbaijan; Georgia lost three wars: to Abkhazia, South Ossetia and, more recently, to Russia. It is true that, unlike Armenia, Georgia has access to sea and doesn’t suffer from double blockade. However, it is important to understand that Georgia enjoyed the same geographic convenience before the 2003 revolution, but, nevertheless, suffered deeper crisis then any other post-Soviet republic due to incompetence and bad governance. I wonder if Georgians would achieve anything had they simply adhered to the convenient excuse of a troubled geopolitical region. Such opinions are very convenient for the corrupt Armenian authorities. 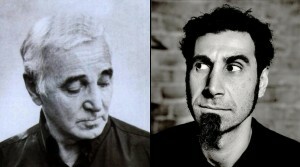 Knowing Serj Tankian as an outspoken activist who has made critical statements — no matter how mild and general they were— about the Armenian government back in Armenia, it is sad to observe that his viewpoint has similarities with that of the traditional Armenian Diaspora, which tends to forgive the ills of the Armenian authorities, thus giving them a green light for further abuses. Again the remedy is in looking at Armenia from a geopolitical perspective. However, in this particular example the speaker is so incompetent as to compare Armenia to all the post-Soviet republics, three of which, the Baltic states, are already full members of the European Union. Furthermore, Setrakian lowers the bar to such a degree that we should be proud of merely having had presidential and parliamentary elections. It no longer matters how fraudulent or deadly they have been. The slogan for such policy could be ‘Don’t criticize Armenia, or else the enemy will benefit.’ It is not criticism that the enemy benefits from, but the consequences of the target of that very criticism. The enemy benefits from Armenia’s bad governance that depopulates Armenia, rather than the desperate outbursts of criticism intended for preventing mass emigration. This policy of forgiveness is a grave punishment for the people of Armenia, who do not have the comforts of these Diaspora Armenians to sit and patiently wait for the geopolitical climate to improve and democratic reforms to evolve. How many more years is this standpoint going to dominate over the Armenian Diaspora? The average number of schoolchildren in Armenia per school was 399 in 2000; it dropped by 35% to 256 in 2010, as reported by CivilNet.com. The Prime Minister rejoices over the increase in emigration of the Armenian people who might otherwise stay and protest. Vardan Ayvazyan, former Minister of Ecology, Head of the Armenian parliament’s standing committee on economic issues, member of the ruling Republican party of Armenia, has characterized the mass emigration as Armenia’s economic benefit. “A migrant is a type of product,” he said on December 16, 2011, as reported by Regnum, a migrant Armenia exports and gets paid in the form of remittances. This was Aznavour’s second resounding blow to the Armenian government following his scandalous interview to Nouvelles d’Arménie published about two months ago (in English at Hetq.am). This time he enraged the authorities with the taboo word of ‘genocide.’ It is noteworthy that in his interview to Nouvelles d’Arménie, Aznavour advised not to concentrate too much on using the word ‘genocide’ to describe the massacres perpetrated by the Turkish government, whereas he chose to use that very term to describe the actions of the Armenian government. These statements made by Aznavour are especially strong in the context of the honors the same authorities had been paying him for many years, including the recently opened museum in one of the best locations in Yerevan. For many years, Charles Aznavour had been the target of Denis Donikian’s poisonous attacks, because of his loyalty to the authorities. What made Aznavour, generally believed to be in bed with the authorities, speak about problems created by these very men of power? Charles Aznavour, who had turned a blind eye to the brutal murder of Poghos Poghosyan, a Georgian citizen of Armenian descent, by Robert Kocharyan’s security agents back in 2001, now speaks against the authorities. In any case, I am glad that the honors from the government have failed to silence Charles Aznavour’s conscience. And I hope other celebrities will reconsider their priorities. But before they do, a number of Diaspora Armenian intellectuals, such as Ara Toranian, editor-in-chief of Nouvelles d’Arménie (Paris), Yeran Kouyoumdjian of Azat Khosk, an electronic publication (Nicosia), according to 1in.am, have echoed Charles Aznavour’s harsh assessments. I strongly believe that this honor, like all those conferred upon Charles Aznavour, will not prevent Serj Tankian from speaking the truth about the authorities for all to hear. What the Armenian government does might not be ‘white genocide’. However, the mechanism is strikingly similar. The authorities’ unpopular policies eventually lead people to emigrate from Armenia. Settling outside Armenia, they run the risk of being subject to whatever the Western Armenians are doomed to, white Genocide, a gradual assimilation as the final stage of the Genocide of 1915-1923. It sounds more like national suicide.